We’d Love to See You, Come and Pick With Us! We are located about midway between Sherwood and Wilsonville, on the side of beautiful Parrot Mountain, about 20 miles SW of downtown Portland. You can certainly use your GPS to find us. Note, however, that there is a lot of growth in adjacent towns that may not be on your mapping device. 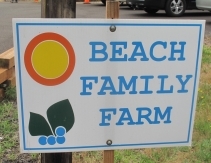 To offset that, we always have directional signs to our Farm approaching from Tualatin, Wilsonville, Sherwood, and Interstate-5. Just look for signs that lead you to us from the NW outskirts of Wilsonville, SW of Tualatin, or SE of Sherwood. We locate signs from just NW of Exit #286 on I-5 also. Look for our characteristic logo of a yellow sun, banded by orange, on the signs. And don’t hesitate to contact us if you need a little assistance!